The word sucrose was coined in 1857 by the English chemist William Miller from the French sucre ("sugar") and the generic chemical suffix for sugars -ose. The abbreviated term Suc is often used for sucrose in scientific literature. The name saccharose was coined in 1860 by the French chemist Marcellin Berthelot. Saccharose is an obsolete name for sugars in general, especially sucrose. In sucrose, the components glucose and fructose are linked via an ether bond between C1 on the glucosyl subunit and C2 on the fructosyl unit. The bond is called a glycosidic linkage. Glucose exists predominantly as two isomeric "pyranoses" (α and β), but only one of these forms links to the fructose. Fructose itself exists as a mixture of "furanoses", each of which having α and β isomers, but only one particular isomer links to the glucosyl unit. What is notable about sucrose is that, unlike most disaccharides, the glycosidic bond is formed between the reducing ends of both glucose and fructose, and not between the reducing end of one and the nonreducing end of the other. This linkage inhibits further bonding to other saccharide units. Since it contains no anomeric hydroxyl groups, it is classified as a non-reducing sugar. Sucrose does not melt at high temperatures. Instead, it decomposes at 186 °C (367 °F) to form caramel. Like other carbohydrates, it combusts to carbon dioxide and water. Mixing sucrose with the oxidizer potassium nitrate produces the fuel known as rocket candy that is used to propel amateur rocket motors. The formula for sucrose's decomposition can be represented as a two-step reaction: the first simplified reaction is dehydration of sucrose to pure carbon and water, and then carbon oxidises to CO2 with O2 from air. Given (higher) heats of combustion of 1349.6 kcal/mol for sucrose, 673.0 for glucose, and 675.6 for fructose, hydrolysis releases about 1.0 kcal (4.2 kJ) per mole of sucrose, or about 3 small calories per gram of product. The biosynthesis of sucrose proceeds via the precursors UDP-glucose and fructose 6-phosphate, catalyzed by the enzyme sucrose-6-phosphate synthase. The energy for the reaction is gained by the cleavage of uridine diphosphate (UDP). Sucrose is formed by plants and cyanobacteria but not by other organisms. Sucrose is found naturally in many food plants along with the monosaccharide fructose. In many fruits, such as pineapple and apricot, sucrose is the main sugar. In others, such as grapes and pears, fructose is the main sugar. Although sucrose is almost invariably isolated from natural sources, its chemical synthesis was first achieved in 1953 by Raymond Lemieux. In nature, sucrose is present in many plants, and in particular their roots, fruits and nectars, because it serves as a way to store energy, primarily from photosynthesis. Many mammals, birds, insects and bacteria accumulate and feed on the sucrose in plants and for some it is their main food source. Seen from a human consumption perspective, honeybees are especially important because they accumulate sucrose and produce honey, an important foodstuff all over the world. The carbohydrates in honey itself primarily consists of fructose and glucose with trace amounts of sucrose only. As fruits ripen, their sucrose content usually rises sharply, but some fruits contain almost no sucrose at all. This includes grapes, cherries, blueberries, blackberries, figs, pomegranates, tomatoes, avocados, lemons and limes. Sucrose is a naturally occurring sugar, but with the advent of industrialization, it has been increasingly refined and consumed in all kinds of processed foods. Table sugar production in the 19th century. Sugar cane plantations (upper image) employed slave or indentured laborers. 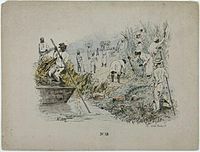 The picture shows workers harvesting cane, loading it on a boat for transport to the plant, while a European overseer watches in the lower right. The lower image shows a sugar plant with two furnace chimneys. Sugar plants and plantations were harsh, inhumane work. The production of table sugar has a long history. Some scholars claim Indians discovered how to crystallize sugar during the Gupta dynasty, around AD 350. Other scholars point to the ancient manuscripts of China, dated to the 8th century BC, where one of the earliest historical mentions of sugar cane is included along with the fact that their knowledge of sugar cane was derived from India. Further, it appears that by about 500 BC, residents of present-day India began making sugar syrup and cooling it in large flat bowls to make raw table sugar crystals that were easier to store and transport. In the local Indian language, these crystals were called khanda (खण्ड), which is the source of the word candy. The army of Alexander the Great was halted on the banks of river Indus by the refusal of his troops to go further east. They saw people in the Indian subcontinent growing sugarcane and making granulated, salt-like sweet powder, locally called sākhar (साखर), pronounced as sakcharon (ζακχαρον) in Greek (Modern Greek, zachari ζάχαρη). On their return journey, the Greek soldiers carried back some of the "honey-bearing reeds". Sugarcane remained a limited crop for over a millennium. Sugar was a rare commodity and traders of sugar became wealthy. Venice, at the height of its financial power, was the chief sugar-distributing center of Europe. Arabs started producing it in Sicily and Spain. Only after the Crusades did it begin to rival honey as a sweetener in Europe. The Spanish began cultivating sugarcane in the West Indies in 1506 (Cuba in 1523). The Portuguese first cultivated sugarcane in Brazil in 1532. Sugar remained a luxury in much of the world until the 18th century. Only the wealthy could afford it. In the 18th century, the demand for table sugar boomed in Europe and by the 19th century it had become regarded as a human necessity. The use of sugar grew from use in tea, to cakes, confectionery and chocolates. 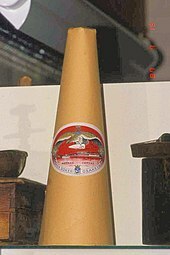 Suppliers marketed sugar in novel forms, such as solid cones, which required consumers to use a sugar nip, a pliers-like tool, in order to break off pieces. The demand for cheaper table sugar drove, in part, colonization of tropical islands and nations where labor-intensive sugarcane plantations and table sugar manufacturing could thrive. Growing sugar cane crop in hot humid climates, and producing table sugar in high temperature sugar mills was harsh, inhumane work. The demand for cheap and docile labor for this work, in part, first drove slave trade from Africa (in particular West Africa), followed by indentured labor trade from South Asia (in particular India). Millions of slaves, followed by millions of indentured laborers were brought into the Caribbean, Indian Ocean, Pacific Islands, East Africa, Natal, north and eastern parts of South America, and southeast Asia. The modern ethnic mix of many nations, settled in the last two centuries, has been influenced by table sugar. Beginning in the late 18th century, the production of sugar became increasingly mechanized. The steam engine first powered a sugar mill in Jamaica in 1768, and, soon after, steam replaced direct firing as the source of process heat. During the same century, Europeans began experimenting with sugar production from other crops. Andreas Marggraf identified sucrose in beet root and his student Franz Achard built a sugar beet processing factory in Silesia (Prussia). However, the beet-sugar industry really took off during the Napoleonic Wars, when France and the continent were cut off from Caribbean sugar. In 2010, about 20 percent of the world's sugar was produced from beets. Table sugar (sucrose) comes from plant sources. Two important sugar crops predominate: sugarcane (Saccharum spp.) 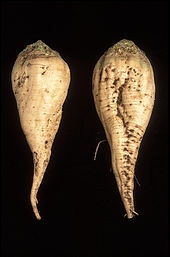 and sugar beets (Beta vulgaris), in which sugar can account for 12% to 20% of the plant's dry weight. Minor commercial sugar crops include the date palm (Phoenix dactylifera), sorghum (Sorghum vulgare), and the sugar maple (Acer saccharum). Sucrose is obtained by extraction of these crops with hot water; concentration of the extract gives syrups, from which solid sucrose can be crystallized. In 2017, worldwide production of table sugar amounted to 185 million tonnes. In mid-2018, India and Brazil had about the same production of sugar – 34 million tonnes – followed by the European Union, Thailand, and China as the major producers. India, the European Union, and China were the leading domestic consumers of sugar in 2018. The low prices of glucose syrups produced from wheat and corn (maize) threaten the traditional sugar market. Used in combination with artificial sweeteners, they can allow drink manufacturers to produce very low-cost goods. Some people regard HFCS as unhealthy. However, clinical nutritionists, medical authorities, and the United States Food and Drug Administration have dismissed such concerns because "Sucrose, HFCS, invert sugar, honey, and many fruits and juices deliver the same sugars in the same ratios to the same tissues within the same time frame to the same metabolic pathways". While scientific authorities agree that dietary sugars are a source of empty calories associated with certain health problems, the belief that glucose-fructose syrups such as HFCS are especially unhealthy is not supported by scientific evidence. The FDA does endorse limiting the consumption of all added sugars, including HFCS. Since the 6th century BC, cane sugar producers have crushed the harvested vegetable material from sugarcane in order to collect and filter the juice. They then treat the liquid (often with lime (calcium oxide)) to remove impurities and then neutralize it. Boiling the juice then allows the sediment to settle to the bottom for dredging out, while the scum rises to the surface for skimming off. In cooling, the liquid crystallizes, usually in the process of stirring, to produce sugar crystals. Centrifuges usually remove the uncrystallized syrup. The producers can then either sell the sugar product for use as is, or process it further to produce lighter grades. The later processing may take place in another factory in another country. Sugarcane is a major component of Brazilian agriculture; the country is the world's largest producer of sugarcane and its derivative products, such as crystallized sugar and ethanol (ethanol fuel). Beet sugar producers slice the washed beets, then extract the sugar with hot water in a "diffuser". An alkaline solution ("milk of lime" and carbon dioxide from the lime kiln) then serves to precipitate impurities (see carbonatation). After filtration,[clarification needed] evaporation concentrates the juice to a content of about 70% solids, and controlled crystallisation extracts the sugar. A centrifuge removes the sugar crystals from the liquid, which gets recycled in the crystalliser stages. When economic constraints prevent the removal of more sugar, the manufacturer discards the remaining liquid, now known as molasses, or sells it on to producers of animal feed. It is difficult to distinguish between fully refined sugar produced from beet and cane. One way is by isotope analysis of carbon. Cane uses C4 carbon fixation, and beet uses C3 carbon fixation, resulting in a different ratio of 13C and 12C isotopes in the sucrose. Tests are used to detect fraudulent abuse of European Union subsidies or to aid in the detection of adulterated fruit juice. Sugar cane tolerates hot climates better, but the production of sugar cane needs approximately four times as much water as the production of sugar beet. As a result, some countries that traditionally produced cane sugar (such as Egypt) have built new beet sugar factories since about 2008. Some sugar factories process both sugar cane and sugar beets and extend their processing period in that way. The production of sugar leaves residues that differ substantially depending on the raw materials used and on the place of production. While cane molasses is often used in food preparation, humans find molasses from sugar beets unpalatable, and it consequently ends up mostly as industrial fermentation feedstock (for example in alcohol distilleries), or as animal feed. Once dried, either type of molasses can serve as fuel for burning. Pure beet sugar is difficult to find, so labelled, in the marketplace. Although some brands label their product clearly as "pure cane sugar", beet sugar is almost always labeled simply as sugar or pure sugar. Interviews with the 5 major beet sugar-producing companies revealed that many store brands or "private label" sugar products are pure beet sugar. The lot code can be used to identify the company and the plant from which the sugar came, enabling beet sugar to be identified if the codes are known. Mill white, also called plantation white, crystal sugar or superior sugar is produced from raw sugar. It is exposed to sulfur dioxide during the production to reduce the concentration of color compounds and helps prevent further color development during the crystallization process. Although common to sugarcane-growing areas, this product does not store or ship well. After a few weeks, its impurities tend to promote discoloration and clumping; therefore this type of sugar is generally limited to local consumption. Blanco directo, a white sugar common in India and other south Asian countries, is produced by precipitating many impurities out of cane juice using phosphoric acid and calcium hydroxide, similar to the carbonatation technique used in beet sugar refining. Blanco directo is more pure than mill white sugar, but less pure than white refined. 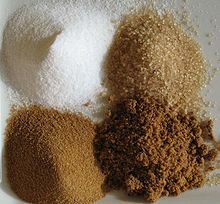 Coarse-grain, such as sanding sugar (also called "pearl sugar", "decorating sugar", nibbed sugar or sugar nibs) is a coarse grain sugar used to add sparkle and flavor atop baked goods and candies. Its large reflective crystals will not dissolve when subjected to heat. Granulated, familiar as table sugar, with a grain size about 0.5 mm across. "Sugar cubes" are lumps for convenient consumption produced by mixing granulated sugar with sugar syrup. Caster (or castor) (0.35 mm), a very fine sugar in Britain and other Commonwealth countries, so-named because the grains are small enough to fit through a castor which is small vessel with a perforated top, from which to sprinkle sugar at table. Commonly used in baking and mixed drinks, it is sold as "superfine" sugar in the United States. Because of its fineness, it dissolves more quickly than regular white sugar and is thus especially useful in meringues and cold liquids. Castor sugar can be prepared at home by grinding granulated sugar for a couple of minutes in a mortar or food processor. Powdered, 10X sugar, confectioner's sugar (0.060 mm), or icing sugar (0.024 mm), produced by grinding sugar to a fine powder. The manufacturer may add a small amount of anticaking agent to prevent clumping — either cornstarch (1% to 3%) or tri-calcium phosphate. Brown sugar comes either from the late stages of cane sugar refining, when sugar forms fine crystals with significant molasses content, or from coating white refined sugar with a cane molasses syrup (blackstrap molasses). Brown sugar's color and taste becomes stronger with increasing molasses content, as do its moisture-retaining properties. Brown sugars also tend to harden if exposed to the atmosphere, although proper handling can reverse this. Scientists and the sugar industry use degrees Brix (symbol °Bx), introduced by Adolf Brix, as units of measurement of the mass ratio of dissolved substance to water in a liquid. A 25 °Bx sucrose solution has 25 grams of sucrose per 100 grams of liquid; or, to put it another way, 25 grams of sucrose sugar and 75 grams of water exist in the 100 grams of solution. The Brix degrees are measured using an infrared sensor. This measurement does not equate to Brix degrees from a density or refractive index measurement, because it will specifically measure dissolved sugar concentration instead of all dissolved solids. When using a refractometer, one should report the result as "refractometric dried substance" (RDS). One might speak of a liquid as having 20 °Bx RDS. This refers to a measure of percent by weight of total dried solids and, although not technically the same as Brix degrees determined through an infrared method, renders an accurate measurement of sucrose content, since sucrose in fact forms the majority of dried solids. The advent of in-line infrared Brix measurement sensors has made measuring the amount of dissolved sugar in products economical using a direct measurement. Refined sugar was a luxury before the 18th century. It became widely popular in the 18th century, then graduated to becoming a necessary food in the 19th century. This evolution of taste and demand for sugar as an essential food ingredient unleashed major economic and social changes. 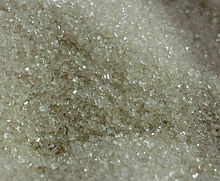 Eventually, table sugar became sufficiently cheap and common enough to influence standard cuisine and flavored drinks. Sucrose forms a major element in confectionery and desserts. Cooks use it for sweetening — its fructose component, which has almost double the sweetness of glucose, makes sucrose distinctively sweet in comparison to other carbohydrates. [clarification needed] It can also act as a food preservative when used in sufficient concentrations. Sucrose is important to the structure of many foods, including biscuits and cookies, cakes and pies, candy, and ice cream and sorbets. It is a common ingredient in many processed and so-called "junk foods". Fully refined sugar is 99.9% sucrose, thus providing only carbohydrate as dietary nutrient and 390 kilocalories per 100 g serving (USDA data, right table). There are no micronutrients of significance in fully refined sugar (right table). In humans and other mammals, sucrose is broken down into its constituent monosaccharides, glucose and fructose, by sucrase or isomaltase glycoside hydrolases, which are located in the membrane of the microvilli lining the duodenum. The resulting glucose and fructose molecules are then rapidly absorbed into the bloodstream. In bacteria and some animals, sucrose is digested by the enzyme invertase. Sucrose is an easily assimilated macronutrient that provides a quick source of energy, provoking a rapid rise in blood glucose upon ingestion. Sucrose, as a pure carbohydrate, has an energy content of 3.94 kilocalories per gram (or 17 kilojoules per gram). If consumed excessively, sucrose may contribute to the development of metabolic syndrome, including increased risk for type 2 diabetes, weight gain and obesity in adults and children. Tooth decay (dental caries) has become a pronounced health hazard associated with the consumption of sugars, especially sucrose. Oral bacteria such as Streptococcus mutans live in dental plaque and metabolize any sugars (not just sucrose, but also glucose, lactose, fructose, and cooked starches) into lactic acid. The resultant lactic acid lowers the pH of the tooth's surface, stripping it of minerals in the process known as tooth decay. All 6-carbon sugars and disaccharides based on 6-carbon sugars can be converted by dental plaque bacteria into acid that demineralizes teeth, but sucrose may be uniquely useful to Streptococcus sanguinis (formerly Streptococcus sanguis) and Streptococcus mutans. Sucrose is the only dietary sugar that can be converted to sticky glucans (dextran-like polysaccharides) by extracellular enzymes. These glucans allow the bacteria to adhere to the tooth surface and to build up thick layers of plaque. The anaerobic conditions deep in the plaque encourage the formation of acids, which leads to carious lesions. Thus, sucrose could enable S. mutans, S. sanguinis and many other species of bacteria to adhere strongly and resist natural removal, e.g. by flow of saliva, although they are easily removed by brushing. The glucans and levans (fructose polysaccharides) produced by the plaque bacteria also act as a reserve food supply for the bacteria. Such a special role of sucrose in the formation of tooth decay is much more significant in light of the almost universal use of sucrose as the most desirable sweetening agent. Widespread replacement of sucrose by high-fructose corn syrup (HFCS) has not diminished the danger from sucrose. If smaller amounts of sucrose are present in the diet, they will still be sufficient for the development of thick, anaerobic plaque and plaque bacteria will metabolise other sugars in the diet, such as the glucose and fructose in HFCS. As with other sugars, sucrose is digested into its components via the enzyme sucrase to glucose (blood sugar) and fructose. The glucose component is transported into the blood where it serves immediate metabolic demands, or is converted and reserved in the liver as glycogen. The sugar refining industry often uses bone char (calcinated animal bones) for decolorizing. About 25% of sugar produced in the U.S. is processed using bone char as a filter, the remainder being processed with activated carbon. As bone char does not seem to remain in finished sugar, Jewish religious leaders consider sugar filtered through it to be pareve, meaning that it is neither meat nor dairy and may be used with either type of food. However, the bone char must source to a kosher animal (e.g. cow, sheep) for the sugar to be kosher. One of the most widely-traded commodities in the world throughout history, sugar accounts for around 2% of the global dry cargo market. International sugar prices show great volatility, ranging from around 3 to over 60 cents per pound in the past[update] 50 years. About 100 of the world's 180 countries produce sugar from beet or cane, a few more refine raw sugar to produce white sugar, and all countries consume sugar. Consumption of sugar ranges from around 3 kilograms per person per annum in Ethiopia to around 40 kg/person/yr in Belgium. Consumption per capita rises with income per capita until it reaches a plateau of around 35 kg per person per year in middle income countries. Many countries subsidize sugar production heavily. The European Union, the United States, Japan, and many developing countries subsidize domestic production and maintain high tariffs on imports. Sugar prices in these countries have often exceeded prices on the international market by up to three times; today[update], with world market sugar futures prices currently[update] strong, such prices typically exceed world prices by two times. Within international trade bodies, especially in the World Trade Organization, the "G20" countries led by Brazil have long argued that, because these sugar markets in essence exclude cane sugar imports, the G20 sugar producers receive lower prices than they would under free trade. While both the European Union and United States maintain trade agreements whereby certain developing and less developed countries (LDCs) can sell certain quantities of sugar into their markets, free of the usual import tariffs, countries outside these preferred trade régimes have complained that these arrangements violate the "most favoured nation" principle of international trade. This has led to numerous tariffs and levies in the past. In 2004, the WTO sided with a group of cane sugar exporting nations (led by Brazil and Australia) and ruled the EU sugar-régime and the accompanying ACP-EU Sugar Protocol (whereby a group of African, Caribbean, and Pacific countries receive preferential access to the European sugar market) illegal. In response to this and to other rulings of the WTO, and owing to internal pressures on the EU sugar-régime, the European Commission proposed on 22 June 2005 a radical reform of the EU sugar-régime, cutting prices by 39% and eliminating all EU sugar exports. The African, Caribbean, Pacific and least developed country sugar exporters reacted with dismay to the EU sugar proposals. On 25 November 2005, the Council of the EU agreed to cut EU sugar prices by 36% as from 2009. In 2007, it seemed that the U.S. Sugar Program could become the next target for reform. However, some commentators expected heavy lobbying from the U.S. sugar industry, which donated $2.7 million to US House and US Senate incumbents in the 2006 US election, more than any other group of US food-growers. Especially prominent lobbyists include The Fanjul Brothers, so-called "sugar barons" who made the single largest[update] individual contributions of soft money to both the Democratic and Republican parties in the political system of the United States of America. Small quantities of sugar, especially specialty grades of sugar, reach the market as 'fair trade' commodities; the fair trade system produces and sells these products with the understanding that a larger-than-usual fraction of the revenue will support small farmers in the developing world. However, whilst the Fairtrade Foundation offers a premium of $60.00 per tonne to small farmers for sugar branded as "Fairtrade", government schemes such as the U.S. Sugar Program and the ACP Sugar Protocol offer premiums of around $400.00 per tonne above world market prices. However, the EU announced on 14 September 2007 that it had offered "to eliminate all duties and quotas on the import of sugar into the EU". The US Sugar Association has launched a campaign to promote sugar over artificial substitutes. The Association now[update] aggressively challenges many common beliefs regarding negative side-effects of sugar consumption. The campaign aired a high-profile television commercial during the 2007 Primetime Emmy Awards on FOX Television. The Sugar Association uses the trademark tagline "Sugar: sweet by nature". ^ CRC Handbook of Chemistry and Physics, 49th edition, 1968-1969, p. D-188. ^ a b c NIOSH Pocket Guide to Chemical Hazards. "#0574". National Institute for Occupational Safety and Health (NIOSH). ^ a b Marcy Nicholson (17 November 2017). "World 2017/18 sugar production, consumption seen at record: USDA". Reuters. Retrieved 21 December 2018. ^ William Allen Miller, Elements of Chemistry: Theoretical and Practical, Part III. Organic Chemistry (London, England: John W. Parker and son, 1857), pages 52 and 54 Archived 2017-04-24 at the Wayback Machine. ^ Marcellin Berthelot, Chimie organique fondée sur la synthèse (Paris, France: Mallet-Bachelier, 1860), pp. 254–55 Archived 2014-06-27 at the Wayback Machine. ^ Hynes, R. C.; Le Page, Y. (1991). "Sucrose, a convenient test crystal for absolute structures". Journal of Applied Crystallography. 24 (4): 352. doi:10.1107/S0021889891002492. ^ All three from CRC Handbook of Chemistry and Physics, 49th edition, 1968-1969, pp. D-184-189. ^ Lemieux, R. U.; Huber, G. (1953). "A chemical synthesis of sucrose". J. Am. Chem. Soc. 75 (16): 4118. doi:10.1021/ja01112a545. ^ John E. Lunn (December 2008). Sucrose Metabolism. eLS. John Wiley & Sons Ltd. doi:10.1002/9780470015902.a0021259. ISBN 978-0470016176. ^ "Foods highest in Sucrose". SelfNutritiondata. Condé Nast. Archived from the original on 2015-07-19. ^ Douglas M. Considine (1982). Foods and Food Production Encyclopedia (1 ed.). Van Nostrand Reinhold Company Inc. p. 956. doi:10.1007/978-1-4684-8511-0. ISBN 978-1-4684-8513-4. ^ a b "Forced Labour". The National Archives, Government of the United Kingdom. 2010. Archived from the original on 2016-12-04. ^ Adas, Michael (2001). Agricultural and Pastoral Societies in Ancient and Classical History Archived 2013-06-14 at the Wayback Machine. Temple University Press. ISBN 1-56639-832-0. p. 311. ^ a b Rolph, George (1873). Something about sugar: its history, growth, manufacture and distribution. 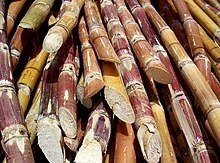 ^ "Sugarcane: Saccharum Offcinarum" (PDF). USAID, Govt of United States. 2006. p. 7.1. Archived from the original (PDF) on 2013-11-06. ^ a b Mintz, Sidney (1986). Sweetness and Power: The Place of Sugar in Modern History. Penguin. ISBN 978-0-14-009233-2. ^ Vertovik, Steven (1995). Cohen, Robin (ed.). The Cambridge survey of world migration. pp. 57–68. ISBN 978-0-521-44405-7. ^ "St. Lucia's Indian Arrival Day". Caribbean Repeating Islands. 2009-05-07. Archived from the original on 2017-04-24. ^ "Indian indentured labourers". The National Archives, Government of the United Kingdom. 2010. Archived from the original on 2011-12-12. ^ Marggraf (1747) "Experiences chimiques faites dans le dessein de tirer un veritable sucre de diverses plantes, qui croissent dans nos contrées" Archived 2016-06-24 at the Wayback Machine [Chemical experiments made with the intention of extracting real sugar from diverse plants that grow in our lands], Histoire de l'académie royale des sciences et belles-lettres de Berlin, pp. 79–90. ^ "Agribusiness Handbook: Sugar beet white sugar" (PDF). Food and Agriculture Organization, United Nations. 2009. Archived (PDF) from the original on 2015-09-05. ^ a b "Sugar: World Markets and Trade" (PDF). Office of Global Analysis, Foreign Agricultural Service, US Department of Agriculture. 4 November 2018. Retrieved 21 December 2018. ^ a b c White, J. S (2008). "Straight talk about high-fructose corn syrup: What it is and what it ain't". American Journal of Clinical Nutrition. 88 (6): 1716S–21S. doi:10.3945/ajcn.2008.25825B. PMID 19064536. ^ a b Parker-Pope, Tara (20 September 2010). "In Worries About Sweeteners, Think of All Sugars". New York Times. Retrieved 2 January 2018. ^ a b "High Fructose Corn Syrup: Questions and Answers". US Food and Drug Administration. 5 November 2014. Retrieved 2 January 2018. ^ "Top Sugarcane Producing Countries: Brazil outperforms its next 6 closest competitors combined". World Atlas. 25 April 2017. Retrieved 2 January 2018. ^ Steindl, Roderick (2005). Hogarth, DM (ed.). Syrup Clarification for Plantation White Sugar to meet New Quality Standards (PDF). Proceedings of the XXV Congress of International Society of Sugar Cane Technologists. Guatemala, Guatemala City. pp. 106–16. Archived (PDF) from the original on 2013-08-10. ^ a b "castor, n.2." OED Online. Oxford University Press, June 2017. Web. 25 July 2017. It says castor is a misspelling that is now the preferred spelling. ^ Taubes, Gary. (April 13, 2011). Is Sugar Toxic? Archived 2017-07-07 at the Wayback Machine. The New York Times. ^ a b "Nutrition Facts for sugars, granulated [sucrose] per 100 g (USDA National Nutrient Database, SR-21)". Conde Nast. 2014. Archived from the original on 7 March 2015. Retrieved 6 March 2015. ^ Gray GM (1971). "Intestinal digestion and maldigestion of dietary carbohydrate". Annual Review of Medicine. 22: 391–404. doi:10.1146/annurev.me.22.020171.002135. PMID 4944426. ^ Kaneko J.J. (2008) "Carbohydrate metabolism and its diseases" Archived 2014-09-22 at the Wayback Machine, p. 46 in Kaneko J.J., Harvey J.W., Bruss M.L. (eds.) Clinical Biochemistry of Domestic Animals, San Diego, CA: Academic Press, ISBN 012370491X. ^ "What causes tooth decay?". Animated-teeth.com. Archived from the original on 2010-02-09. Retrieved 2010-05-05. ^ Tooth Decay Archived 2014-10-25 at the Wayback Machine. Elmhurst.edu. Retrieved on 2011-11-18. ^ What causes tooth decay? Archived 2010-02-09 at the Wayback Machine. Animated-teeth.com. Retrieved on 2011-11-18. ^ Tanzer, JM (August 1979). "Essential dependence of smooth surface caries on, and augmentation of fissure caries by, sucrose and Streptococcus mutans infection". Infection and Immunity. 25 (2): 526–31. PMC 443577. PMID 489122. ^ Wolever, Thomas M. S. (2006). The Glycaemic Index: A Physiological Classification of Dietary Carbohydrate. CABI. p. 64. ISBN 9781845930523. Archived from the original on 2017-12-16. ^ a b Wolever, Thomas M. S. (2006). The Glycaemic Index: A Physiological Classification of Dietary Carbohydrate. CABI. p. 65. ISBN 9781845930523. Archived from the original on 2017-12-16. ^ a b Food and Nutrition Board, Institute of Medicine of the US National Academies (2005). Dietary reference intakes for energy, carbohydrate, fiber, fat, fatty acids, cholesterol, protein, and amino acids (macronutrients). National Academies Press. p. 323. Archived from the original on 2015-07-15. ^ The Great Sugar Debate: Is it Vegan? Archived 2009-09-19 at the Wayback Machine. Vegfamily.com. Retrieved on 2011-11-18. ^ a b Yacoubou, MS, Jeanne (2007). "Is Your Sugar Vegan? An Update on Sugar Processing Practices" (PDF). Vegetarian Journal. Baltimore, MD: The Vegetarian Resource Group. 26 (4): 16–20. Archived (PDF) from the original on 2008-04-09. Retrieved 2007-04-04. ^ EC – Export subsidies on sugar Archived 2009-04-10 at the Wayback Machine. (PDF). wto.org. Retrieved on 2011-11-18. ^ Agriculture – Sugar Archived 2009-08-22 at the Wayback Machine. Ec.europa.eu (2004-07-14). Retrieved on 2011-11-18. ^ The Fiji Communiqué on Sugar. ACP Group of States. Acpsec.org (2007-05-03). Retrieved on 2011-11-18. ^ International Sugar Trade Coalition Archived 2009-06-01 at the Wayback Machine. Sugarcoalition.org. Retrieved on 2011-11-18. ^ "Sugar Daddie$". Mother Jones. 1997-05-01. Archived from the original on 2008-12-02. Retrieved 2010-05-05. ^ European Commission – External Trade – Trade Issues Archived 2009-09-05 at the Wayback Machine. Ec.europa.eu (2010-05-06). Retrieved on 2011-11-18. ^ Sugar Association Archived 2009-08-31 at the Wayback Machine. Sugar.org. Retrieved on 2011-11-18. Yudkin, J.; Edelman, J.; Hough, L. (1973). Sugar: Chemical, Biological and Nutritional Aspects of Sucrose. Butterworth. ISBN 978-0-408-70172-3. Wikimedia Commons has media related to Sucrose.